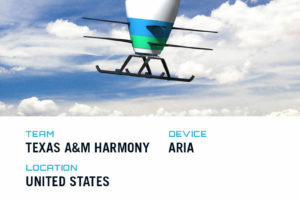 A full-scale mock-up of the Jetcopter vertical-takeoff-and-landing concept vehicle will be shown for the first time at April's AERO 2019 show in Friedrichshafen, Germany. 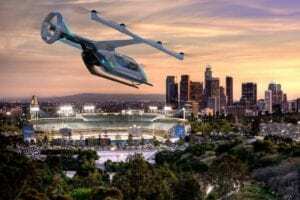 The startup air taxi's claim to fame is its powerplant: Dual 500 hp, 6,000 rpm motors — converted from automotive applications — push two 200 cm air turbines. The resulting 600 mph airflow velocity powers the Jetcopter to a claimed top speed of close to 200 mph with a 620-plus-mile range. 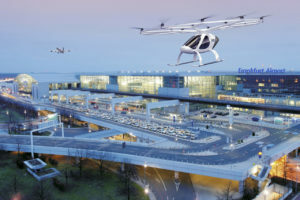 The Jetcopter is unusual in that it does not have large rotor blades, like a helicopter, fixed wings, or tiltable turbines distributed to the ends of shafts like other air taxis. Instead, its two turbines are fixed above the cabin and it is engineered to divert the airflow to four endpoints, where the air can be vectored in a chosen direction, helping to direct the aircraft, a la the Harrier Jump Jet. That unusual turbine configuration is part of the reason for the Jetcopter's high power. 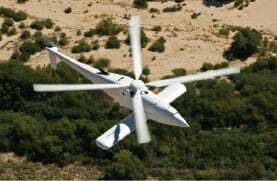 Because of the smaller rotor, "it is possible that you need to spin the turbine faster and with more power," Jetcopter spokesperson Donatas Skulskis told sister publication Avionics International. "A bigger rotor, less power it needs to take off. But, bigger rotors are not an advantage." Skulskis said the benefits of the Jetcopter-style propulsion over traditional helicopter rotors are increased safety and the ability to make it more affordable than a helicopter. "Our final product will cost about 500,000 — maybe dollars, maybe euro," Skulskis said. One benefit to the lack of extended wings or rotors is a smaller form factor for the Jetcopter. The company says it "could be parked in a medium-sized van garage." Its maximum takeoff weight of 4,400 pounds also means that it will fit into new proposed certification standards in Europe, according to Skulskis. 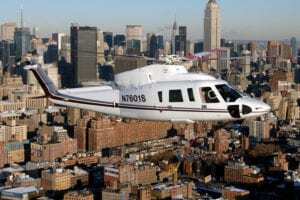 While larger vehicles require lots of flight time before being certified, he said that they're hopeful the five-seat Jetcopter's road to certification will be smoother. The increased rotor velocity will create noise at a higher frequency, Skulskis said, which might make it louder within 30 feet or so, but outside of that, within the surrounding half-mile, it should actually be quieter than a vehicle with a slower, larger rotor, because high-frequency sound doesn't travel as far. The timeline for the Jetcopter is still "pending," according to Skulskis, but he thinks it could accelerate quickly. He said they could build the compartment in "a few months." The biggest outstanding issue, from an engineering standpoint, are the rotor blades. He said that after some trial and error — which ruled out aluminum as an alloy option — it looks like carbon-fiber is the way to go, but it's crucial that the blades are the right blend of light and strong. Getting that right could require a year of work, he said. In addition to an air taxi, the Jetcopter is also being considered for cargo duty and as a "better drone," Skulskis said. Every version of the vehicle will have automatic hovering and largely automated piloting featured — another benefit over traditional helicopters, which Skulskis described as being very difficult to fly — so it should be easy to adapt for those different duties, in theory. "Me, personally, I will be the first buyer of this aircraft. 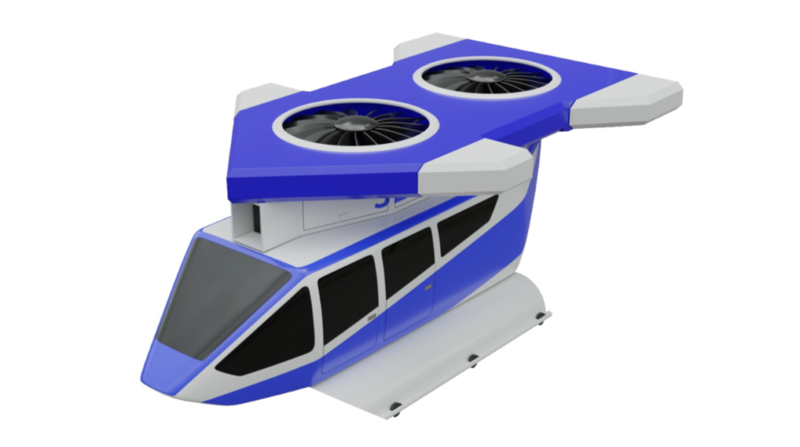 I value what helicopters do, but they don’t fit my need," Skulskis said, adding that it's important that the Jetcopter succeeds because so many other air taxis he sees being worked on are "flying nonsense made by very famous companies."